I received a complimentary copy to provide this post. All opinions are my own. My daughter is going through the most adorable phase of absolutely loving all things Toy Story! So when I saw that Toy Story That Time Forgot was being released for the FIRST TIME on Blu-ray™, Digital HD and Disney Movies Anywhere, I had to own a copy for our family. 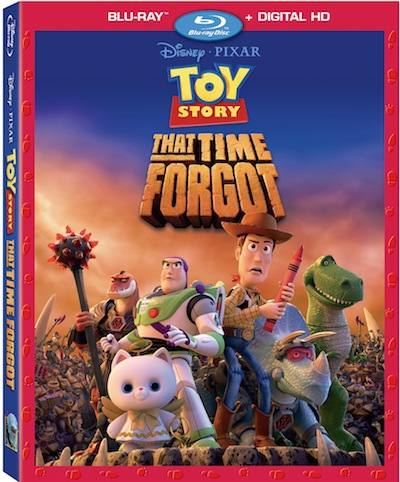 Disney•Pixar proudly presents a hilarious new animated adventure, TOY STORY THAT TIME FORGOT, Join Woody (Tom Hanks), Buzz (Tim Allen) and the gang for an unforgettable tale packed with family fun and a must-have for every Pixar fan’s collection! During one of Bonnie's post-Christmas play dates, the “Toy Story” crew find themselves in uncharted territory when the coolest set of action figures ever turn out to be dangerously delusional. It's all up to Trixie, the triceratops, if the gang hopes to ever return to Bonnie's room. “Toy Story That Time Forgot” is an unforgettable tale packed with family fun and a must-have for every Pixar fan’s collection! My daughter LOVED this when it aired on TV last year, so much that we recorded it on our DVR. But now that we own it, we can watch it on Amazon Instant Video through Disney Movies Anywhere. It includes deleted scenes, so we got to see how Pixar thought of this adorable story. And it is amazing to see the Pixar process at work. There are also some cute deleted scenes that my kids love. You can buy your copy now on Amazon and at local retailers. It's a great movie to add to your Holiday video collection.